Unlike mudjacking, where the mud injection forms a cone under the slab (point up), the polyurethane injection expands permeating all voids to create a supporting pillow. Exterior concrete slabs are quite strong under compression (downward force) but do not have great flexural or bend strength. This means that if the soil supporting a slab is strong, the concrete can support enormous loads. If it’s weak, however – such as when a slab is bridging a void -- the concrete may crack and sink. 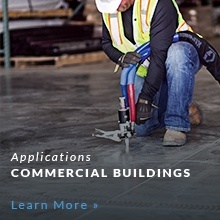 PolyLevel® dealers have proven solutions for concrete sinking and cracks. 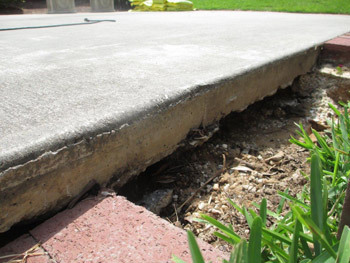 Don't risk the tripping hazards or unsightly spaces - schedule a free estimate for exterior concrete repair! Concrete slabs are often subject to a lot of stress. 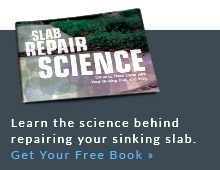 A tree root may work its way under a slab, grow, and push the slab up. Or, a root may die, rot, and leave a void. Improper fill or fill that has not been well compacted may also create subsurface voids. Poor drainage can also affect exterior concrete. A chronically saturated area can cause soil to compress and the sidewalk to sink. Rainwater runoff may erode the soil beneath a slab and can also cause it to sink. Unexpected heavy loads, such as a truck delivering building supplies or dumpster loaded with old roofing, can also sink sections of a sidewalk or driveway. Exterior concrete slabs, such as sidewalks and driveways can be quickly lifted and stabilized with expanding polyurethane foam injection. The PolyLevel® method for lifting and stabilizing a sidewalk or other exterior concrete slab is to inject structural polyurethane foam under the sunken section of concrete. The force of the expanding foam will fill all voids and consolidate weak soils. When the voids are filled, the upward pressure of any additional foam will raise the slab to its original level position. 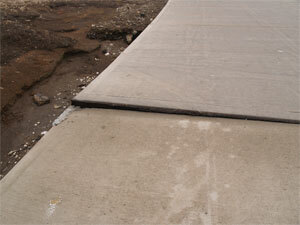 PolyLevel® is a concrete leveling application that is quick and easy and extremely effective. It can fix sinking concrete indoors, outdoors and even on decks and patios. For more information on how PolyLevel® can help your concrete slab, find a PolyLevel® dealer near you and inquire about a free quote on residential slab jacking and other services.